They say there is a first for everything. 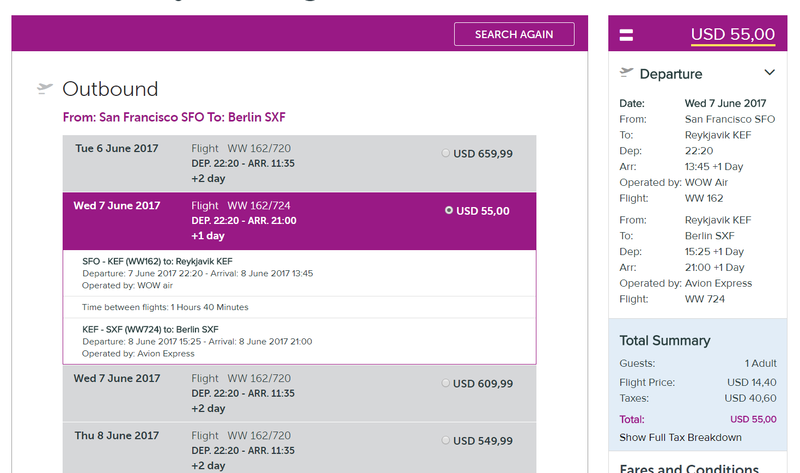 Flying to Europe this JUNE for as little as $55 one-way ($85 return), is unheard of. The key to snagging a $55 flight is being ULTRA flexible. Even if you don’t care for one of the $55 cities, just get to Europe and catch a train to your desired destination! You’ve likely heard of Wow Airlines by now, they are a budget carrier based in Iceland. You can check out my review from Paris to Boston on Wow, I was pleasantly surprised by their service. The key with budget airlines is trying to avoid the extra fees. They only allow a small carry-on item to be brought on-board, larger bags, included checked luggage, is extra! If you really want to save the most money, it is best to forgo the extras like seat reservations and heavy luggage, but to each their own. For a return flight, I found an option from Dublin for $85 to Los Angeles. Since you have departure fees, the cost is $30 more than your outbound flight to Europe. If you can get to Berlin, a cheap flight can be found to Dublin for under $100, two cities for under $250!